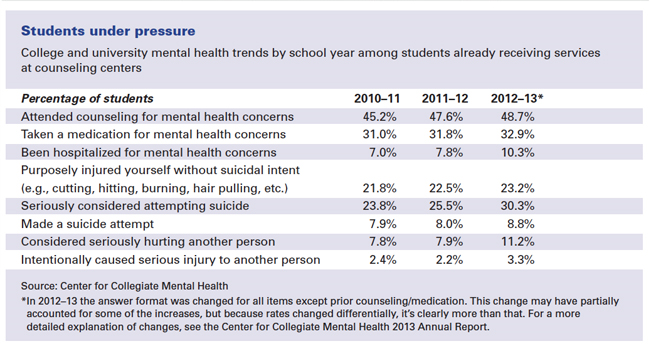 Mental health cases in college students have reached astronomical levels in the last few decades. More and more students are facing problems that affect not only their sociological well being, but also the physical and social drain that comes with it. It causes students afflicted with these disorders to become less involved in social activities, as well as have decreased performance in school activities. This could lead to several dangerous outcomes that could affect the well-being of students, including their social and professional relationships, overall morale, thoughts of dropping out, and if serious enough, thoughts of suicide and death. Hello, my name is David Whitaker. I am currently attending Allegany College of Maryland for my first degree in Education. I'm currently studying to become a professor in Art. I have lived in Western Maryland for my entire life and have loved studying art for my entire life. I also love exploring the wonders of the internet. The current crisis in which I am trying to address is the abundant increase of mental health cases among college students, which has reached astronomical levels in the last decade, and what is being done to help those who need it. 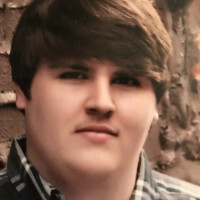 Even though there has been notions to help understand the problem more and provide those with these conditions the treatment they need, colleges and universities still are lagging behind because of budget, time, and staff constraints. The purpose of this proposal is to shed light on what mental health is and how it affects students, what can be done to help those students, and how it is all achievable. 61% of people seeking out services at counseling center were inquiring about anxiety. Other concerns include depression (49%), stress (45%), family issues (31%), academic performance (28%) and relationship problems (27%). 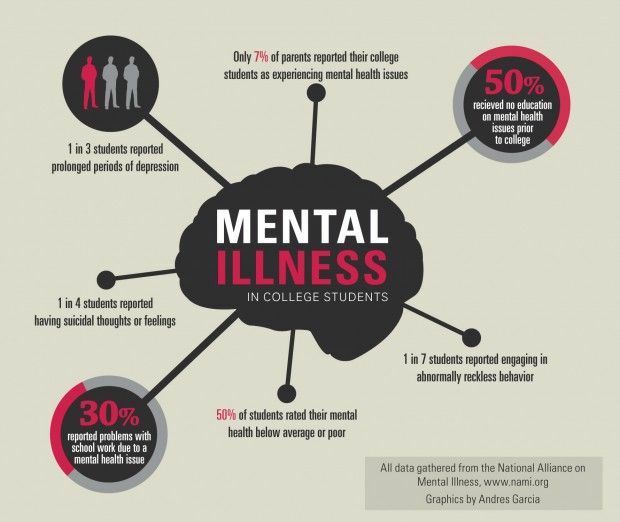 64% of students stopped attending college due to mental health related reasons. The primary diagnoses of these students are depression, bipolar disorder and post-traumatic stress disorder. Mental health issues are seriously affecting the work of college students. 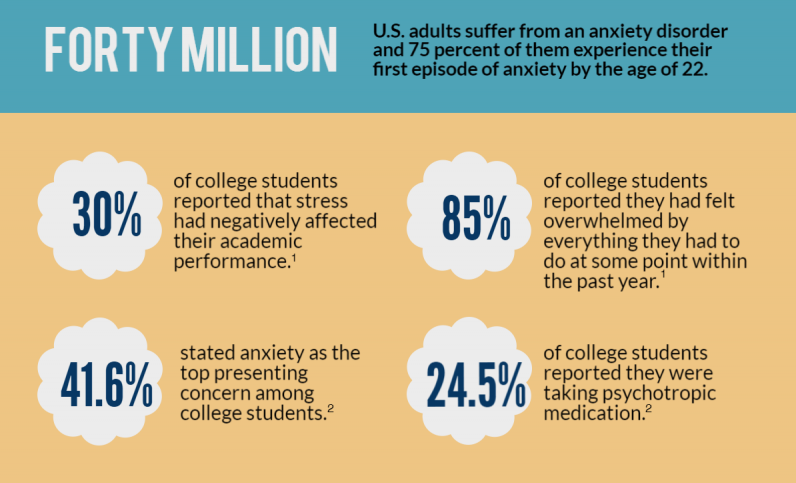 In a 2016 survey of students by the American College Health Association, 53% reported feeling that things were hopeless and 39% reported feeling so depressed that it was difficult to function during the past 12 months. In the image below, it states information collected by the Anxiety and Depression Association of America. In a survey given to counseling center directors of colleges and universities, the mean student-to-counseling-staff ratio at colleges and universities was 1,737:1. Smaller institutions had smaller ratios, on average (705:1 at schools smaller than 1,500 students), while larger institutions had larger ratios (2,624:1 at schools with more than 35,000 students). Institutions are struggling to keep up with the growing problem. One staff member shouldn't be induced to taking care of the well being of almost half, or even all, of the entire student population at any college. Below shows the certain things that counselor directors observed in students. Below shows the certain things that counselor directors observed in students. Even though colleges and universities have counseling services, some students are not accessing the services provided. Listed below are some startling statistics that really express the problem. 72% experienced a mental health crisis on campus. Yet 34% reported that their college did not know about their crisis. 57% did not access accommodations through college disability resource centers, often citing that they were unaware such services and supports existed or did not know how to access them. 40% did not access mental health services and supports at their school. 36% cited stigma as a barrier to accessing their college’s mental health services and supports, making it the number one reason students don’t access treatment. Only 25% of students with a mental health problem seek help. Shows views on how the problem can be fixed. Gives in-site on what Mental disorders are affecting college students. 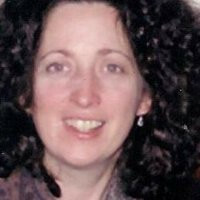 Used to help seek out medical and other needs of help. Also shows how mental health affects college students. Article explaining the importance of the issue. Explains the need for action in this growing problem. Statistics used to show why students are going to counseling services and the mean average of student to counselor ratio. explains in depth the entire crisis. A real look into the lives of people with mental illnesses. Allegany College of Maryland is a two-year public community college located in Cumberland, Maryland. It was previously known as Allegany Community College. Most colleges and universities already have set in place programs and services that already help those in need, but studies have shown that they are operating way over their capacity and threatening the effectiveness of the services. If more money resources were used to help better these programs then we could see a decline in crisis before it gets way to out of hand. Another resource that students might not know they are there is the off-campus solutions offered by physicians, doctors, and hospitals. Sending students if their mental disorder is drastic enough will help the student control or even overcome their mental disorder and set them on a path of healing. 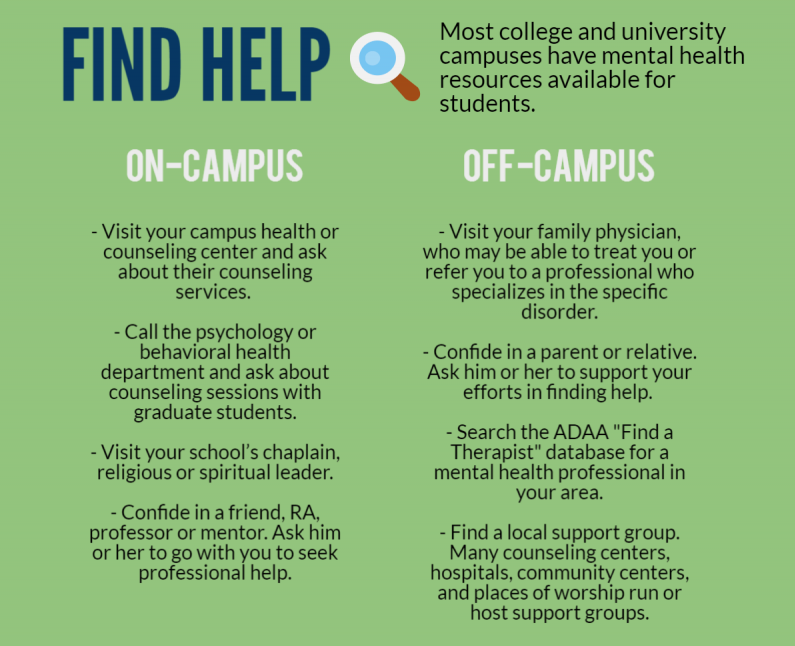 If students are finding difficulty finding help, or aren't sure that their school offers services to help, colleges and universities should try and put out more publicity and add campaigns to their students to try and show that they have those services. This can help display that the institution is trying to share a positive message to show that they want their students to succeed, and to show students that they have the proper clarifications to get the help they need. A great way to help students get over their mental disease is to allow for outside activities. Extra-curricular activities that are run by the students themselves, or even concerned Professors can help students thrive and teach them to try and get outside of their shell. It could help students to better cope and help them build better relationships. With the addition of better services, introduction of organizations and clubs, and ad campaigns, the performance of students could increase. Showing students different opportunities they can explore can lead to several different avenues that are opened for the students involved. they can learn to handle their disorders and not let it define them. Since students would see that colleges and universities are learning to better understand them, it could lead to more students staying in school instead of leaving to get better. Also with students deciding to stay on board, institutions could see an increase in the graduation rates gradually over time. Since institutions are taking an interest in helping, it would help build a meaningful relationship with the students, causing medical professionals and therapists to seek out better treatment options for their patients. With increased attention on their student populations, colleges and universities could also see a direct correlation in the amount of applicants applying for their school. Currently, the foundations of a program or service to help students in need is in place but suffers from budget constraints. Counseling services that are located on-campus are a crucial way that will help students help with their afflictions. My plan is to ensure that there is enough money for these services to thrive. When applying for a college, there are certain fees that are included so that a college can provide public services. Give students the accessibility to help support these services, and colleges and universities to be able to have the necessary funds to make improvements or to hire more staff. For example, a student population of 5,000 who pays a fee of $50 a semester would raise about $250,000 a semester to help the program. They could use this money to hire more staff or upgrade the center. Of course, there would should be limitations to this so that bigger institutions won’t take advantage of their students. Are you happy for the outcome? The Proposal Dream Burnout: The Student Mental Health Crisis needs your vote by December 6, 2019.